pocketnowvideo has recorded a 6 minute video to show the voice control features coming in Mango. By default, Symbian already has some voice controls to open apps and contacts but that hasn’t really changed much beyond that. Vlingo on the other hand adds some neat voice features similar here, but in Mango it’s all integrated. BTW, I don’t know why the US version seems to have this odd crappy computer voice. I’ve got some British woman speaking on my voice commands who doesn’t really speak like a computer. One of the reasons I didn’t use Vlingo much was I had to keep turning the app on and then having to open it and press the voice button (I’m not sure if there’s a way to set up a short cut button). When calling a contact, you can set which number to call – be it mobile/home (currently does this already) and now you can set it to go on speakerphone. 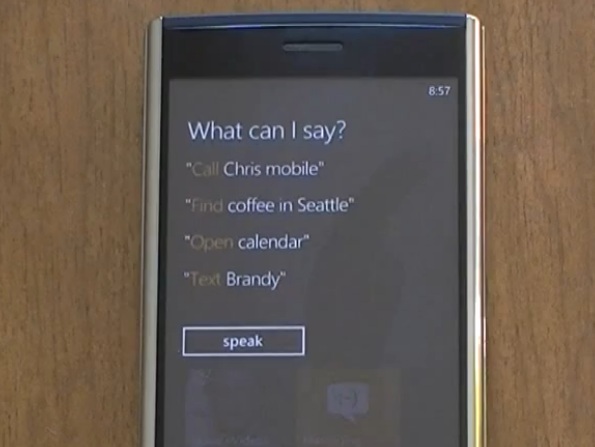 You can also text via voice to text. I’m not sure how accurate this is, I wouldn’t send a long message with this. It worked well enough in the demo (though it does have to be relatively quiet I guess). A useful feature here is that it replays the message back to you to make sure the message transcribed is correct. A good feature if using the phone hands free (driving) or for folks with visual impairment. A long awaited feature is that it now mentions names from who is calling you. This is something I found really useful with Symbian. Intermittently during your ringtone, it will mention the name of who’s calling. This helps in knowing whether to rush and try to answer the phone, or just let it ring/cancel. Something I’ve noticed friends and family taking advantage of. No need to look at the screen – just listen out for the name. Though sometimes it is harder to ignore a call when you’re amongst friends when this thing blurts out the name but you don’t want to appear to be avoiding. Odd situations aside, think hands free, driving. Unfortunately it doesn’t look like to can answer the call by voice. PocketNow notes that there’s currently no way to control media player with voice like in Windows Mobile. As noted, these features might come particularly useful when driving and the law requires you to use hands free. It would also be useful perhaps for people who are blind or partially sighted. Lastly, it’s also cool to see it in action – friends find this simple feature oddly impressive (and I say my other phone did stuff like this ages ago – oh well). If you’re following tech in general you’ll remember iPhone create a buzz with their media player voice controls. That buzz subsided and no one cares any more about that. But they’re supposedly bringing out something that takes voice control much more seriously with Voice Assistant to navigate the phone just with voice. Cheers Anastasios-Antonios Toulkeridis for the tip!